Feeling a little chaotic, then this boat wrap design by Jason Mathias art is just what you need: Featuring a massive Blue Marlin greyhounding after some Tunas over a sunset framed ocean wave and frigate birds. This unique boat wrap design is available for purchase in 3 different options. 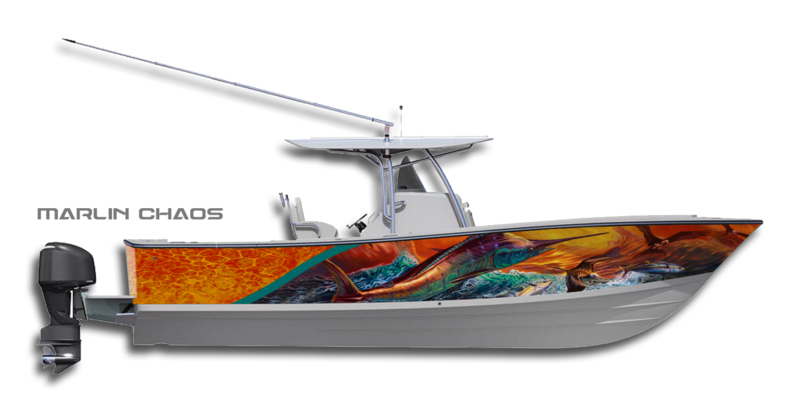 •Option 3: (Printed wrap + Installation) Have our professionals come to you to have this awesome design installed on your boat. We have preferred installers all over the U.S. If we don't have one in your area we will find one for you. Printed wraps are priced at $7.00 a square foot.